When it comes to last week’s epic trivia throw down, Jeremy has already offered up his side of things and a detailed play by play, but I feel it’s only fair that the world hear my side of things. Much like Jeremy, and like any true nerd really, I was more than a little bit cocky about my ability to hold my own in a music trivia contest. I have worked hard to earn my music nerd title, and I was not about to let someone dismiss me so easily. We were hedging out bets though, both frequently following out biggest of boasts with, “but I could totally lose to him/her and be ok with it.” Yea, it sort of takes some of the smack out of our smack talk, but I suppose cocky just isn’t our color. When it came to the night of the competition, I was more than a little nervous. Not only was I expected to compete against a more than worthy competitor, I had to do it in front of 12 coworkers. I even made the mistake of inviting a friend! What was I thinking?! It started off easy enough, though. We were tied with perfect scores well into round two- with questions about Janet’s nip slip, Purple Rain, Bill Haley & The Comets, and the 84 VMAs – but then the “side jobs” category rolled around. What is the name of Billy Bob Thorton’s band? I drew a total blank. I could give a lecture about his on air tangent after being asked about his acting career and comparing himself to Tom Petty… but his band. I had nothing. My confidence was shaken. Then I missed the bonus question about CBGB’s. And I felt it. I knew the shelf full of books on NYC’s punk scene would be taunting me when I got home. It didn’t help that not only was my pride on the line, but the loyal comrade who had placed a bet in my favor was now bribing me with promises of a burrito (BURRITO!). I made it through round three relatively unscathed, only missing a Sonic Youth question, which isn’t my taste, so it stung, but not too bad. At this point Jeremy had a perfect score. I… did not. Round four gets hazy. I think I’m just blocking out the trauma as a defense mechanism. Reviewing the questions now, it’s little wonder why. The questions got RIDICULOUS. Example: Unscramble “CALL DIER LESBIANS” and get Belinda Carlisle. In what world does this belong in a TRIVIA competition?! Then an audio challenge with the Xymox. Literally no one at our table knew it. I still maintain that the one person in the bar who got it used Shazam (but I’m not bitter). By the end of round four I knew I was bested. I didn’t even have to hear the bonus question. Short of a question about the The Monkees or Lady Gaga, I had little to no chance of beating Jeremy. I stood up, shook his hand, and bowed. He had won. The fates decided that I had not been properly hurt. The final bonus question was about Rolling Stone’s recent Women Who Rock: The 50 Greatest Albums of All Time list. We were asked to name the top 5 artists from the list. Aside from the fact that I have a serious deep seated hatred of best of lists, specifically the “female as category” lists, this one really hurt. So much so that Jeremy and I were still complaining about it days later. In what world does Mary J. Blige out rank Etta James? Adele ranking higher than Blondie? Missy Elliott above Madonna? Should “best ofs” really be eligible? Does Dolly Parton and Patsy Cline really belong on a “rock” list (Yes, we were arguing the definition of rock). To add insult to injury, none other than Rob Sheffield, who’s poster would be on my bedroom wall if they made posters of rock writers, wrote the intro for the list. Really Rob? I expected so much better from you. All that doesn’t matter though. Jeremy and I both came out of the final bonus with two of the five. He had in deed won the title, the glory, and the crown… which he was all too happy to model for us. Maybe one day we can have a rematch. 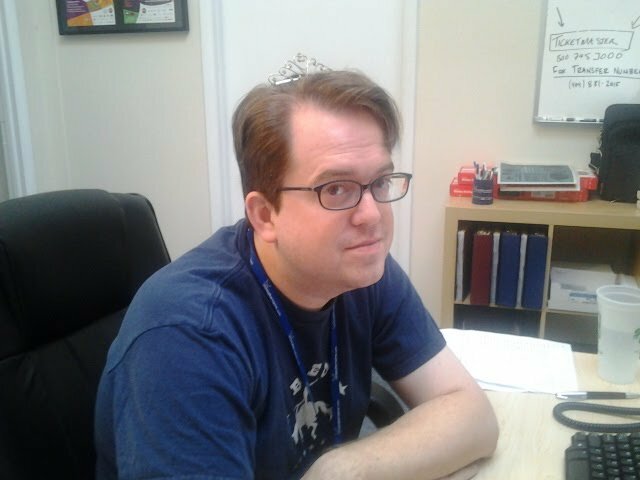 I’d really like my tiara back. TA Staffers, Molly and Jeremy, & Their Music Trivia Challenge! Our CSR, Jenn, went to Mount Rushmore and snapped this awesome pic!